Our climb up Triglav Mountain, Slovenia’s highest mountain involved a 2 day trek. We departed our Hotel,” Hotel Alpina”,Kranjska Gora, at 10 am on Monday 17th, and arrived at the start of the walk after driving to the end of a forest road in the Krma Valley. At 11:10am we set off in a slight mist. It was a marked trail the whole way to the top, initially through wooded areas and then onto open mountain. It took us four and half hours to get to Planika Dom, where we would over night, after climbing about 1,500m over a distance of about 10km.As we were settling in to our temporary accommodation we noticed six people descending from Triglav. It transpired they were our fellow BHC hillwalkers SC , JJ et al who had chosen to climb Triglav along an alternative route, beginning in the Kot Valley. They would be overnighting in Triglav Lodge at Kredarica. by 7:40 am we were on our way. The route to the top was well protected with iron cables & poles particularly in the more exposed areas along the ridge.The route was demanding but technically manageable with ample foot holds in the limestone rocks; The main challenge was the extreme exposure in places !!. We arrived at the top 2864m, at about 9:30am and did the compulsory photo-shoot and Monro hug before beginning our descent. We all arrived back safely at Planika Dom around 11:30am. There was plenty of banter and chatter on the way up and down and all in all it was an exhilarating and enjoyable experience for everyone. We relaxed at Planika Dom until 12:10pm and then we continued our journey down. We initially passed through stunning valleys bordered by craggy limestone peaks which eventually gave way to woodland tracks.We arrived at Konjsko Sedle , 2020m at 12:37pm and stopped for lunch at Vodnikov Dom at around 13:30pm. The weather was good up to the final hour when we were subjected at this point to multiple peels of thunder and lightening and the accompanying rain. 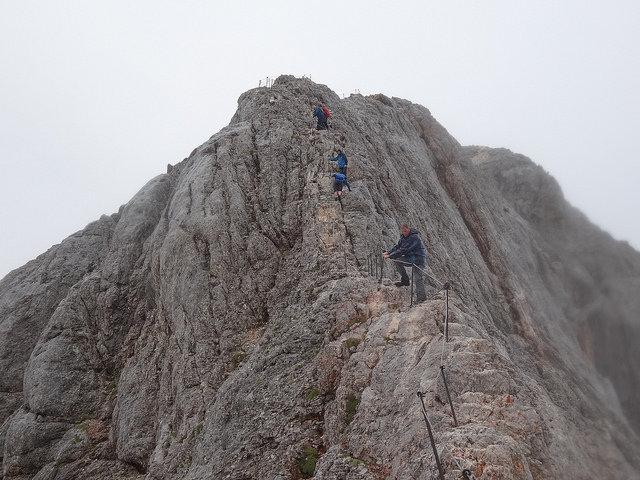 Our guide Iztok, who had been involved in mountain rescue for many years had informed us earlier that he had personally been in volved in the recovery of 32 bodies from the mountain over the years many of whom had been the victims of lightening strikes. So you can imagine we didn’t dally on the mountain!. All the way down we were serenaded by songs from Tommy , Louise , Linda, and Michael. We arrive at the car-park at 5:30pm. The waiting bus was a welcome sight. At this stage we had been walking on the mountain almost 10 hrs. A group of six led by BHC walk leader Sean Cotter climbed Triglav in one day without helmets, harnesses or lanyards/hooks to attach to the fixed steel ropes. 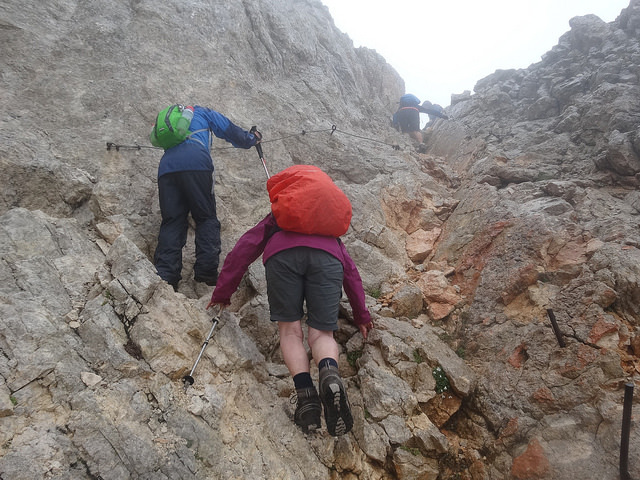 Started south of Mojstrana in the Kot Valley and climbed over 2,200 metres in 6.5 hours to the top of Triglav (2864 m), via Valentina Stanica and Triglavski Kredarica huts, in light rain and wet cloud. Bulgarian people that we met on our way back down from Triglav and who requested that we bring them down from the first section that they had climbed up to (both had vertigo problems). 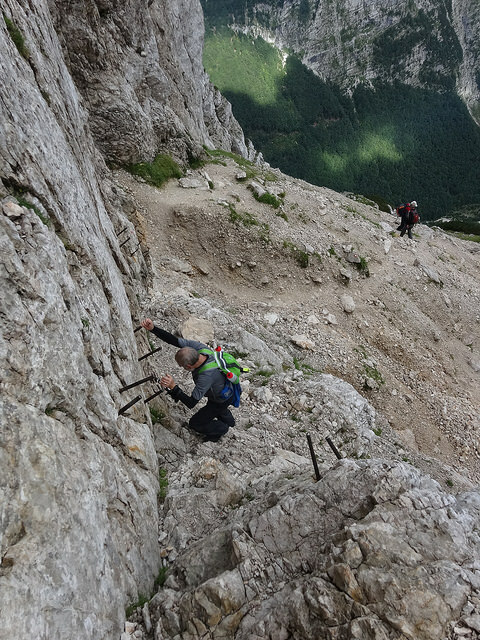 lots of Via Ferrata sections, to the Aljazev hut in the Vrata Valley (west of the Kot Valley) in 4.5 hours. Both routes are on the north side of Triglav.